The PEP™ (Personal Electroporation Pak) is a self-contained portable cuvette module compatible with the ECM 399, ECM 630, ECM 830 and ECM 2001. The PEP connects to these generators, allowing the safe delivery of HV electrical pulses to cuvettes. 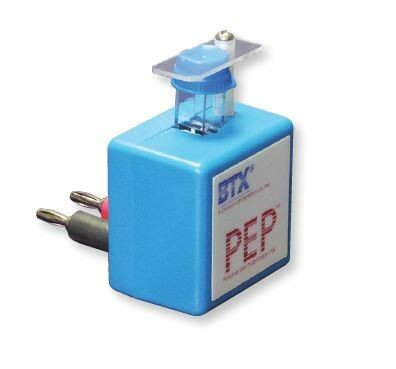 The PEP holds one cuvette and is an ideal solution for quick singular transfections. Connection cables are not required. Other Built-in safety interlock disconnects the internalelectrodes when cuvette is removed.